Homemade marshmallows anyone? A simple DIY that isn’t as intimidating as it may look! 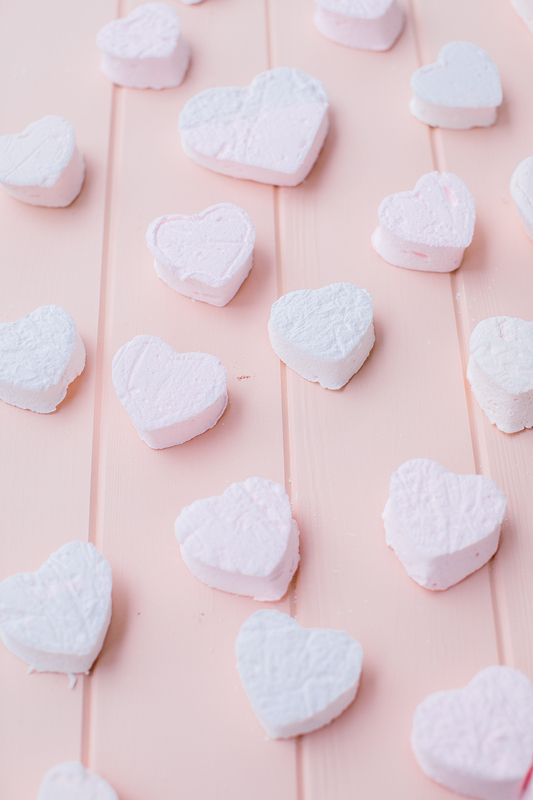 We whipped these up for an adorable Valentine’s craft (think lovable s’mores) coming soon to the blog. 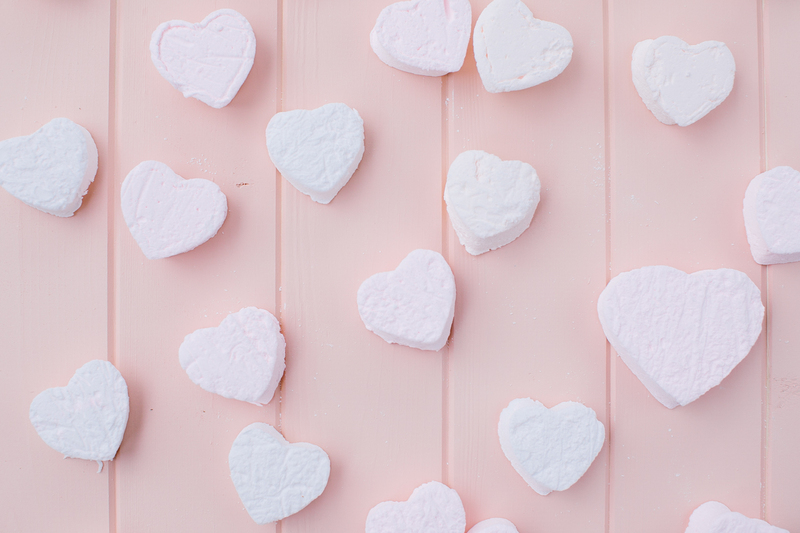 While prepping for our upcoming post, we thought we would share just how we made these cute heart marshmallows. 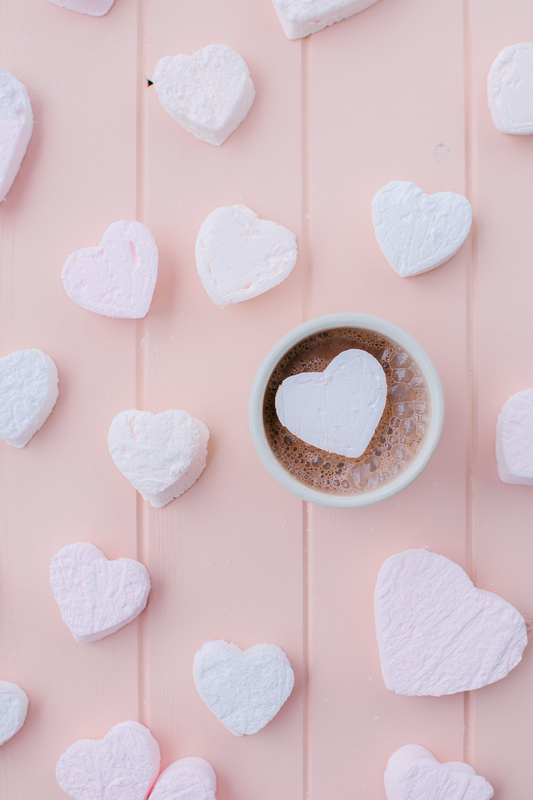 With only a few short steps, you will be on your way to making delicious fluffy hearts! 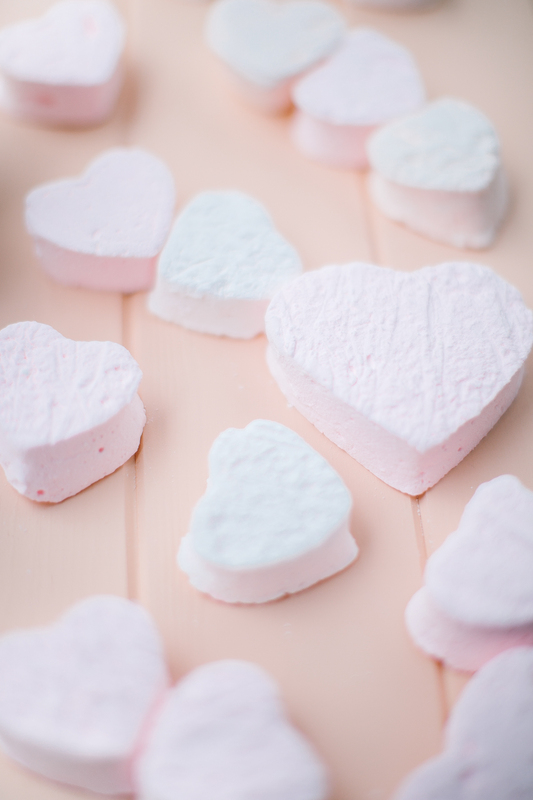 These marshmallows are great to have around the house with Valentine’s Day around the corner. Not to mention they’re the perfect addition to a cozy hot chocolate too! We added different tones of pink and peach to the color tones to add a hint of flirty-ness. Start by soaking the gelatin in ice-cold water. Make sure to add one sheet at a time. Place a candy thermometer in the pot. Turn the stove on to medium-high heat. Squeeze out all the excess water from the gelatin sheets. Add the gelatin to the egg-white/sugar mixture – the meringue! – while it’s hot. Keep mixing on high speed for around 10-15 minutes until thick and glossy and the sides of the bowl are cool to the touch. If you want to add in food coloring, this is the time to do it! Note: We made a double batch of the marshmallows for photo purposes in three different shades of pink. I would not suggest doubling the recipe unless you have the largest size of Kitchen Aid mixer. 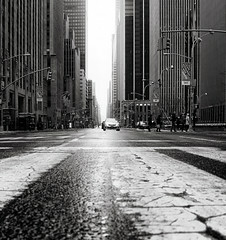 The next day, mix together ¼ cup of cornstarch and ¼ cup of icing sugar. 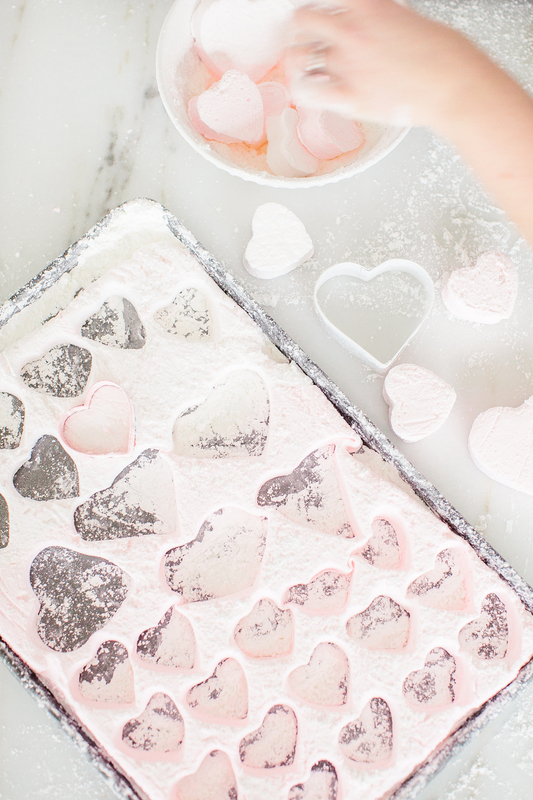 Cut out the marshmallows using a heart cookie cutter. 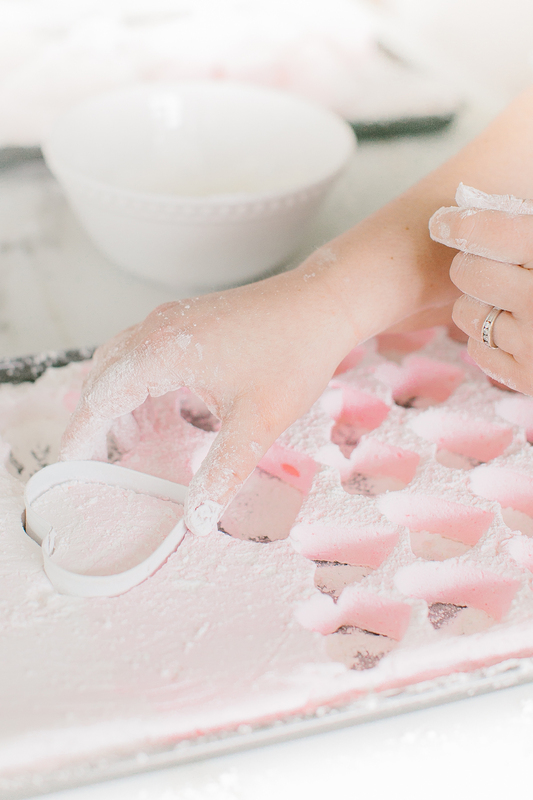 Roll each heart in the icing sugar mix and arrange in an airtight container. These marshmallows are good for up to 1 week in a sealed container in the fridge. *If you can’t find sheet gelatin, it’s no problem. Switching it out for powdered gelatin is easy. For this recipe, you’d need 2 1/2 Tbsp. of powdered gelatin. You’ll need to sprinkle the gelatin over 1/2 cup of cold water in a small bowl and let it stand for 1 minute before using it. Gently heat the gelatin mixture until it has melted before pouring it into the meringue. Heat up the milk with the maple syrup over medium-low heat. Bring it to a low simmer and whisk in the cocoa powder, chopped chocolate, and a pinch of salt. Mix until the chocolate is fully melted. We love using a small handheld frother to make it foamy. 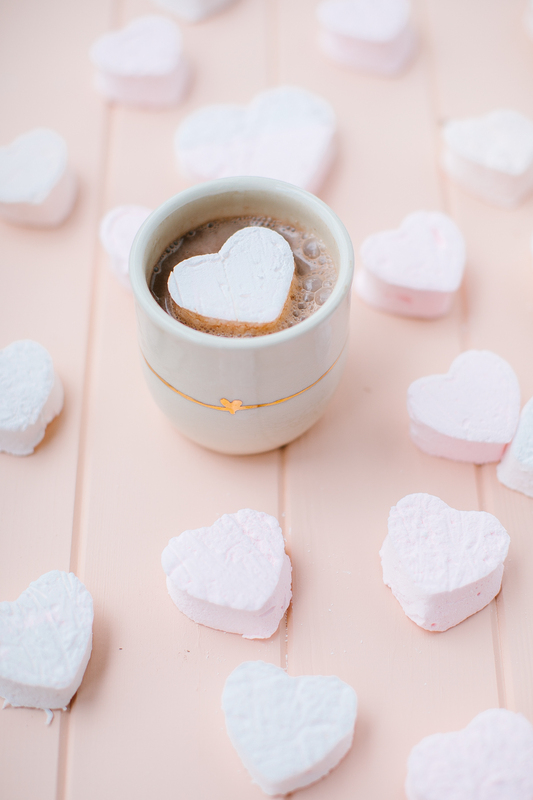 Serve immediately in your favorite mug and top with a beautiful fresh marshmallow. 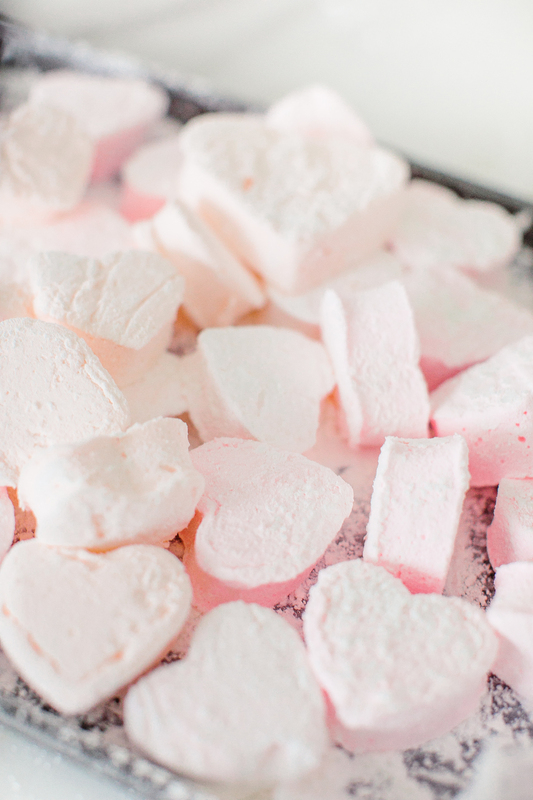 You read the article DIY Heart-Shaped Marshmallows. 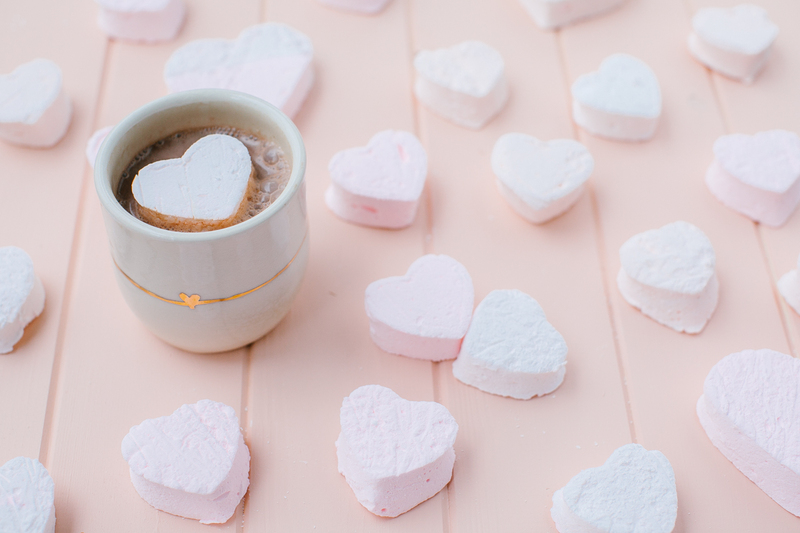 All materials on the site Fsetyt com, as well as the article DIY Heart-Shaped Marshmallows - written with the purpose of enriching the information and we will be glad if you like our magazine.